In order to build a successful business in today’s hypercompetitive world, it’s essential to have an army of loyal customers and employees. Few companies understand this better than Enterprise Holdings, which has quietly grown from the basement of a Midwest auto dealership into the world’s largest car rental company. Enterprise has achieved much of its success by following a simple philosophy espoused by founder Jack Taylor back at the company’s founding: “Take care of your customers and employees first, and the profits will follow.” By putting customer and employee loyalty at the heart of everything it does, Enterprise has transformed itself into one of the biggest privately held, family-owned businesses ever created. It has built a unique model for wowing customers and maintaining an engaged and dedicated workforce. It has also discovered how to use the power of technology, full-spectrum marketing, and select partnerships to help expand its mission and fuel the bottom line. In Driving Loyalty, you’ll get an inside look at Enterprise’s secrets for outsmarting the competition by treating both customers and employees like royalty. It’s a proven formula that brings customers back again and again, while attracting employees who stay with the company for the long term. The principles Enterprise lives by provide an excellent case study for how any business can offer exceptional customer service, create a high-performing work environment, and build an enormously successful company. In addition to winning numerous awards for customer service excellence, Enterprise has long been known for being one of the best companies to work for. Its unique structure allows employees to make autonomous decisions, free of needless bureaucracy. It also ties compensation directly to customer service survey results and company profits. Enterprise has operated under the radar for much of its history (which was part of the company’s overall business strategy). Several years ago, the company opened its doors to me for the first time to share the Enterprise Rent-A-Car customer service story. The resulting book, Exceeding Customer Expectations, was named one of the 30 Best Business Books of 2007 by Soundview Executive Book Summaries. While the basics remain, much has changed since Exceeding Customer Expectations was written. For one thing, Enterprise was a stand-alone business back then. The company has subsequently restructured and now owns Alamo Rent A Car and National Car Rental as well, thanks to an enormously successful acquisition that was almost immediately accretive to earnings, despite predictions to the contrary from some industry insiders. Enterprise also went counter to its own original thinking, since initially the company frowned on the idea of purchasing large competitors, preferring to grow organically instead. Indeed, Enterprise has tweaked and refined a number of its business practices in recent years, allowing the company to report a continuous stream of revenue increases, even in a challenging economy. What’s more, by implementing the principles revealed in this book, the customer service and employee retention scores for Enterprise, Alamo, and National have all significantly improved. In Driving Loyalty, you’ll discover the lessons that have turned Enterprise into the fifteenth-largest private company in the world. You’ll learn how to think differently, engage your workforce more effectively, lead with empathy, deliver dazzling customer service, market effectively online and off, and let customers fuel your company’s growth in order to generate a powerful bottom line. At its heart, Driving Loyalty is a guide to running an employee-centered company that caters to its customers. You’ll learn how applying these proven, timeless values to virtually any business can lead to exceptional performance. Driving Loyalty also highlights lessons from other companies that have successfully employed similar techniques, to offer a full array of ideas that can be put to work in your own business. In the coming chapters, you’ll discover how to put some of the Enterprise magic to work in your own company, thus helping to drive incredible loyalty and positioning your business to grow beyond your wildest dreams. We’ll start by taking a closer look at Enterprise’s history, including the previously untold story of how it came to acquire National and Alamo several years ago. We’ll also talk about the process the company went through in deciding whether to keep all three brands, and how doing so allowed it to reach a much larger audience of loyal customers. We’ll then explore what Enterprise does to engage its workforce, including the management techniques it uses to drive productivity and retention. Next we’ll talk about Enterprise’s proven approach for exceeding customer expectations, both through its employees and increasingly through the effective use of technology as well. The last few chapters are devoted to several other important elements of Driving Loyalty among your customers and employees, such as the most effective marketing strategies in today’s very noisy world, the best ways to grow and expand your business, the importance of forming key partnerships, and why it’s critical to operate in a sustainable manner. By uncovering the secrets that Enterprise and other well-respected companies use to instill loyalty, you’ll be armed with the key tenets needed to find and retain fantastic employees, build a global brand, provide excellent service, and achieve tremendous success regardless of what industry you’re in or what type of customer you are trying to reach. 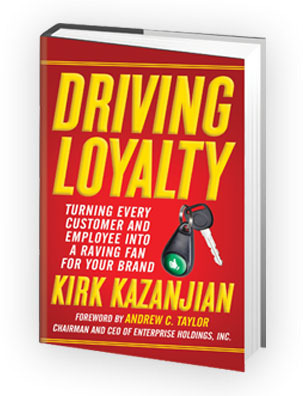 From Driving Loyalty by Kirk Kazanjian. Copyright 2013 by Kirk Kazanjian. Excerpted by permission of Crown Business, a division of Random House, Inc. All rights reserved. No part of this excerpt may be reproduced without written permission from the publisher.